Our associate pastor, Bryan Hall, recently preached a two-part series on how to interpret the Bible. He took a couple of weeks off from preaching through 1 Corinthians to do this (right before the text on head-coverings and submission in chapter 11). I thought this was a helpful approach, and one worthy of consideration by pastors. Every sermon models good or bad hermeneutics, like it or not, and preaching a couple of messages on interpretation made for good instruction and a helpful prelude. We have looked at mentoring, internships, and church-based seminaries as ways to train pastors in the local church. We will now consider the concept of a churches partnering with another church or ministry to train men for ministry. A church may not be ready to launch its own training program, but by partnering with another church or parachurch ministry, it can bring pastoral training to its local context. Other churches and ministries have already worked to develop programs of ministerial instruction, and a church can partner with them to provide facilities and opportunities to train men. Working cooperatively in this way can be a healthy expression of fellowship and unity in Christ, including reaching across denominational lines. It also holds great potential for the efficient use of the resources, gifts, and time of those involved. Such cooperation may also yield further development and fruitfulness for both parties. If a church is to partner with another church or ministry, several factors merit consideration before committing to such an arrangement. 1. There must be doctrinal and practical agreement between the church and the ministry it partners with. When a church works with a ministry of its own denomination or when sister churches of the same denomination cooperate, this may be easiest. However, a Baptist church could conceivably cooperate with a non-denominational ministry that trains pastors. Both parties need to decide what level of agreement they will require to work together, and their goal may help determine that level. If they simply want to train men called to the ministry by teaching them basic skills for hermeneutics and homiletics, then they may simply need to agree on the fundamentals of the faith while allowing for different views on church polity or what constitutes a Scriptural baptism (especially if they open the program to men outside their own local church). However, if the church wants to train men specifically for service in a particular denomination with a well-defined ecclesiology, they have a good reason to expect more agreement in those matters. (The church and other ministry could also agree to partner only for particular courses with the church pursuing other options for more specific denominational training.) Both parties must agree on what constitutes a sufficient level of doctrinal agreement and must be likeminded concerning the goal of their training. 2. Both parties will need to agree on who teaches. They will need to decide if the ministry they are partnering with will provide all the teaching or if they will combine forces by involving staff from the host church. 3. The partnership will need a liaison between the two parties. This is absolutely essential in a multi-staff church, but it could be helpful in a church with a solo pastor as well, particularly if he is already very busy. Whether the liaison is a pastor, a deacon, a staff assistant, or someone else, there needs to be a clear channel of communication between both sides to help avoid confusion. The liaison can help coordinate such important matters as announcements, scheduling, copying and distribution of materials, specifics relating to facility use (including who unlocks and locks the doors). 4. Financial responsibility needs to be well-defined in this partnership. If the teachers are to be compensated in some way, whose burden will that be? Depending on the arrangement and abilities of the parties, one could bear all the responsibility or they could share. They might even take up offerings at the meetings! Nevertheless, financial responsibility needs to be discussed up front. 5. Technical details will need to be discussed. What kind of room will the training require? Is there a need for microphones? Will the church supply items like a projector or audio/video recording equipment and media, or will the other ministry? (This may also go back to the question of financial responsibility, particularly if the church does not already have such equipment in place if needed.) Will one party supply the textbooks for the men or will they purchase them on their own? The Cumberland Area Pulpit Supply (CAPS), an extension of Bancroft Gospel Ministry, Kingsport, Tennessee, has partnered with churches such as Fellowship Chapel (Bristol, Virginia), Happy Bible Church (Happy, Kentucky), Jenny’s Creek Gospel Church (Kermit, West Virginia) to train men in hermeneutics and homiletics through lectures, textbooks, assignments, and sermons in class. Seminary for All (SFA), a ministry of Grace Evangelical Free Church in Kingsport, Tennessee, utilizes The Theology Program for video-based instruction, classroom discussion led by the facilitator, as well as textbooks. While the focus of this program is theology for laypeople, pastors in training could benefit from this instruction as well, particularly if seminary is not an option for them. Seminaries and Bible Colleges can also partner with churches. Extension courses and extension centers allow many men to work toward a degree while continuing to serve in their home church. This is another good example of a partnership between a church and another ministry. If you are interested in a partnership such as these, you may also want to check around in your area – there may be churches and ministries already training men and you may be able to partner with them. Ask other pastors; ask others in your denomination. You may already have what you need in the neighborhood. Whether it is cooperating with a church in the next town, bringing in a parachurch ministry to partner with, or utilizing the program of another organization, partnering with others to train men in the local church is a worthy and beneficial approach. In the next installment of this series, we will look at the traditional seminary as a way to train pastors in the local church. Doug Smith is blessed to be the husband of Krystal and father of three daughters. He is a member of Cornerstone Chapel, in Bristol, Tennessee. Doug has preached in a supply capacity and taught hermeneutics with the Cumberland Area Pulpit Supply, a ministry which focuses on training men for ministry in rural Appalachia. You may email him with any questions or comments. What do you think? Are there other things to consider for a church to cooperate with another ministry to train pastors? Do you know of some other ministries churches could partner with to train men for ministry? When you are in trouble, it is a blessing to know that help is available. It is a great blessing to know that it is on the way. And it is an even greater blessing to know that your help is here. 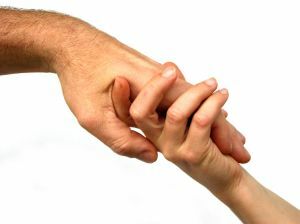 The blessing of help in time of need is magnified even more when others are involved. If you have had vehicle trouble with a van full of small children, you know what I mean. And if you have not experienced such a thing, you can surely imagine it or relate a similar circumstance where help is needed, not just for an individual, but for a group. In our spiritual lives, as individuals and as groups—particularly local churches—we experience crises. The world, the flesh, and the devil are set against our having joy in Christ and glorifying God in all circumstances. Persecution and temptation—external opposition, internal strife, and disappointments—threaten to shake our faith. We need help, and help is available. But God’s Word has better news for us than that help is on the way. When we turn to Psalm 46, we see the good news that our help is here. In unstable and uncertain times, we can have stability and certainty because God is our help, and He is here. The book of Psalms functioned as a songbook and prayer book for Israel. The psalms reflect much about the experience of God’s people—joy and thanksgiving as well as repentance, complaints, and cries for help. Some psalms clearly indicate the event that is addressed in the psalm. For example, Psalm 51 describes David’s repentance after being confronted about his sin of adultery. Others, such as Psalm 46, do not tell us the exact occasion for which they were written. However, Psalm 46 is one of the eleven psalms with the inscription “Of the Sons of Korah.” It is especially appropriate that we take a brief look at the background of the sons of Korah as we consider this corporate psalm of God’s help for His people in troubled times. Numbers 16 is the record of Korah’s organized rebellion against Moses. After the congregation of Israel separated from the rebels, God caused the ground to swallow up Korah and his followers alive to show His judgment against them. But according to Numbers 26:9-11, there were sons of Korah who did not die. Though not part of the Aaronic priesthood, the Korahites (also descendants of Levi) served in the temple. According to 1 Chronicles 9:19, they were still in existence after the Babylonian exile. Their background in being spared while their rebellious ancestor perished should have made them thankful to sing praises to God for His present help in trouble. As we look at Psalm 46, let those of us who are believers be grateful for God’s salvation and look to Him to see that our help is here. We will notice three different emphases in this psalm. It teaches us about the people of God, the person of God, and the presence of God. v. 1 God is our refuge and strength. v. 2 Therefore we will not fear. Many psalms are worded in the first person singular with “I” and “my” and “me,” but this is one of the corporate psalms, worded with we and our and us (6 instances). The corporate nature of this psalm reminds us that our relationship with God is not merely an individual relationship that has no relevance to our relationships with others. Rather, it changes the dynamics of our relationships to others. When we become God’s children, we find that we have brothers and sisters. I am not an only child to God, and neither are you. All God’s people are part of a larger group. But before we discuss the importance of the group, let me ask you this: Do you have a right relationship with God? Have you been forgiven of your disobedience and reconciled to Him? God created this world, including you and me, for His glory to display His character. Yet Adam and Eve—and you and I—have rebelled against God. Our sin has rightly been called cosmic treason; disobeying God is equivalent to seeking to dethrone Him and enthrone ourselves as the king of our lives. This treason deserves eternal punishment. Yet in His great mercy, God sent His Son, Jesus, the eternal Son of God, who was born of the virgin Mary, lived the perfect life that God requires and that we could never live, and died on the cross in the place of sinners, bearing their punishment. He rose from the dead and lives forever. He promises to pardon and rescue rebels like you and me if we will turn from our sin and trust Him for our salvation. If you do not have assurance that you are part of the people of God through faith in Christ, I beg you—trust in Him today. If you have turned from your sin and trusted in Him, then you have the certain hope and assurance of salvation in Christ. But He has not saved you for yourself; you are part of a larger body, the church. If you are trusting in Christ, part of following Jesus means to identify with His people. We do this identification through baptism or the immersion into water as an ordinance of the church in order to testify to the world that we are dead to sin and raised to walk in newness of life in Jesus Christ. To identify with God’s people, we should also join ourselves to a local congregation, becoming members of a local church, where we can participate in the decisions of the congregation and also be subject to its discipline. We take gathering with the church seriously. We attend so we may grow from the preaching of the Word and partake of the Lord’s Supper. We also fellowship and encourage and warn one another, being involved in the lives of others. If you know Christ but have not been baptized or joined a local church, let me urge you to obey God in these areas. Do not be afraid or ashamed to be publicly united to other believers. In our individualistic society, many do not value commitment. But to please God, we must value commitment to one another and love Christ and one another enough to identify ourselves as His people. As God’s people, we understand that our Lord’s concerns extend not just to our individual problems, but to the problems we face corporately, particularly in local churches. Whether with your local assembly or with persecuted believers gathering in Saudi Arabia or Sudan, God, our Help, is there. He is a very present help in trouble. God is clearly the subject of this psalm. Twenty-five different references to Him appear throughout these eleven verses. We see a divine name or title eleven times (God, the Most High, the LORD of hosts, the God of Jacob, the LORD), a metaphorical description five times (refuge, strength, help), and deity pronouns nine times (I, He). This God who is our Help is the God who made heaven and earth. As the Most High, there is no God or power above Him. This God is the LORD. Notice in verses 7, 8, and 11 that the word “LORD” is in all uppercase letters. This use designates that the original Hebrew has the word for the most sacred name of God—Jehovah or Yahweh. It is probably derived from the same name that God revealed to Moses in Exodus 3:14, when He revealed Himself as I AM WHO I AM. This God has the power of self-existence, needing nothing outside Himself to exist. He has all the resources of life in Himself, whereas we need food, water, oxygen and other external circumstances to live. God’s sacred name not only refers to His self-existence but also speaks of His covenant relationship with His people. This God—the God of Abraham, Isaac, and—as focused on in Psalm 46—Jacob—is the same God for the Korahites, for the Israelites, for the first-century believers in Christ, and for you and me. The God who showed mercy and faithfulness to Abraham, Isaac, and Jacob has not changed—His people can still count on Him. Notice that this sacred name is paired with “of hosts” in verses 7 and 11. This reminds us that God is omnipotent and commands all the powers of the universe. This self-existent, faithful, promise-keeping, all-powerful, exalted creator God is our Help! The metaphors in Psalm 46 indicate our dependence on God. He is our refuge, the One we run to for shelter. We trust in Him to protect us. He is our strength. Apart from Him, we are weak and faint. We have reason to fear if He is not our refuge and strength in trouble. He is also our help, providing the aid we need in our distress. This God is our fortress who protects us in troubled and unstable times—our stronghold and safe place. He is our defense. We do not need to fear trouble. We can trust God. God’s names, titles, and descriptions remind us of His character, but we also learn about Him through His works. This God dwells with His people and helps them “at the break of dawn” (v. 5)—not a second too late. He opens His mouth and unleashes His omnipotent decree: “he uttered his voice, the earth melted” (v. 6). When He thus speaks, compliance is the only option. None can withstand His judgment. Regardless of your view on global warning, we haven’t seen anything yet! God will one day speak, and the heavens will be destroyed by fire, and “the elements will melt with fervent heat” (2 Peter 3:12 NKJV). The psalm mentions the desolations God has brought on the earth. We can see astonishing things today that show the power of God. The Grand Canyon shows evidence of the catastrophic effects of the power of God. Hurricanes, tornados, and volcanic eruptions are just glimpses of the infinite strength of the Almighty. This God has power to stop wars, break the bow, shatter the spear, and burn the shields with fire. God says, “Be still, and know that I am God; I will be exalted among the nations, I will be exalted in the earth!” (v. 10). Calm down. Quiet your troubled soul. Make certain that you truly know that God is God and that He will be exalted in the earth. Consider the greatness of God, Who is the permanent, powerful, preeminent protector of His people. We should not fear trouble if we know Him. We should not fear to take the gospel to those near and far away, even if they react with hostility. God is our refuge and strength, and He will be exalted in the earth. Our Help is here. Notice how Psalm 46 emphasizes the presence of God: “God is…a very present help in trouble” (v. 1). He is “in the midst of” the city of God (v. 5). He is “with us” (vv. 7, 11). It is not unusual to experience a period of waiting for help to arrive after we call for it. We may know that it is available, and we may know that it is on the way; but it is another thing altogether to know that it is here. It could be available but not come to us. It could be on the way but encounter a roadblock. God is not just potential Help or Help who might arrive—He is already on the scene. The child of God never has trouble in which the Lord is not present, ready to help. He dwells among His people in their midst. He is with us even now. Knowledge of God’s presence should encourage us. His river makes the city of God glad. He was with Joseph in the midst of all his trials (Gen. 39:2-3, 21, 23). God’s promise of His presence encouraged Moses and Joshua and the returned exiles who rebuilt the temple (Ex. 3:12, Josh. 1:5, Hag. 1:13; 2:4). God has also promised to be with believers today. Jesus Christ, when charging His disciples with the Great Commission, told us, “Lo, I am with you always, even to the end of the age” (Matt. 28:20). The unchanging one, Jesus Christ, who is the same yesterday, today, and forever, has promised never to leave us so we can say with boldness and confidence, “The LORD is my helper; I will not fear. What can man do to me?” (Heb. 13:6). This God dwells with you if you are a believer. He dwells in a special way in the midst of His called-out ones, His church. If you are trusting in Him today, you can be encouraged that God is with you, a very present Help in trouble. Our Help is here. It is a great encouragement when needed help arrives. But the help of God is far greater and more necessary than any human help we may need. We all need God’s help every day in the troubles of this life. We are tempted to fear and worry when the circumstances we face seem like the earth shaking and mountains falling into the sea. When things threaten to change life as we know it, we need the help of God to survive the storm. It may come. Things may change. But God, the only source of stability in unstable times, is unchangeable. God’s help is promised to His people forever. But there are those who will not survive storms and calamity and judgment. Friend, if you are not looking to Christ today, you are in trouble and great danger. You do not know when you will draw your last breath. God will judge all people with His perfect justice. He requires perfect obedience to His commands, but we have all failed in this regard. The penalty for such an offense against the infinitely high dignity of God is eternal, conscious torment in hell. Yet because of His great love, God sent His Son Jesus, who perfectly fulfilled the requirements of His holy law to take our punishment if we trust Him. If you forsake your sin and efforts to make yourself acceptable to God and simply trust in the One who has done the work for you, you will find a very present help in trouble. Are you facing fear and anxiety? “God is our refuge and strength, avery present help in trouble” (v. 1). Our Help is here. Are you discouraged? Our Help is here. Are you tempted? Our Help is here. Uncertain, unstable times should serve as a reminder to look to the certain, stable, faithful God. “Be still, and know that [He is] God” (Ps. 46:10). He can be trusted. He is our refuge and strength. Encourage one another with this truth from Psalm 46—our Help is here. 1. William S. Plumer, Psalms: a Critical and Expository Commentary with Doctrinal and Practical Remarks – Geneva Series Commentary (Carlisle, PA: the Banner of Truth Trust, 1975), 522-523. 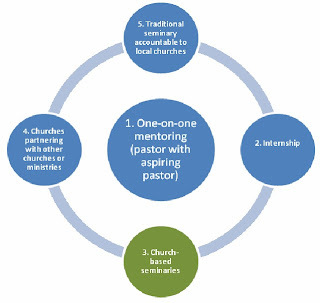 So far in this series, we have considered one-on-one mentoring and internships as avenues for training men for pastoral ministry in the context of the local church. In this article we will contemplate the idea of church-based seminaries. A church-based seminary differs from what is now known as a more traditional seminary in several ways. A church-based seminary is directly accountable to one local congregation, whereas the seminary’s accountability may be to multiple churches or to a denomination. A church-based seminary will be smaller than most well-known seminaries. This usually means a better student-teacher ratio and more interaction out of the classroom. It may mean less library resources are available to students, but this gap may be overcome in churches with large collections or in churches located close to major traditional seminaries. One can expect cost of tuition at a church-based seminary to be less than most traditional schools. Church-based seminaries may or may not be accredited by a regional organization (tuition fees will probably reflect this, but not necessarily). Church-based seminaries may or may not exclusively employ their own church staff as instructors; some provide classes with professors from other churches or schools. For example, The Midwest Center for Theological Studies, in addition to faculty from their own church (such as Dr. Sam Waldron and Dr. Richard Barcellos), have utilized professors such as Drs. Tom Nettles, Tedd Tripp, and Don Whitney to teach semester-long or intensive modular courses. For a church to begin a church-based seminary, there must be clear agreement. The pastor(s) and the congregation must be in harmony and see this as a legitimate extension of the command to train others in 2 Timothy 2:2. They must agree that this ministry is desirable and helpful. The pastor(s) and church must also agree on what the church-based seminary should accomplish. This may take some time to pray through, talk through, and hammer out (although it should be the heartbeat of the pastor(s) and then presented to the congregation). Should it only train students for the ministry? Should it be accredited to give their graduates more of a credential than they might otherwise get? If seeking accreditation, what agency should one go with (a regional one that accredits secular schools as well, or an agency that only accredits religious schools)? Who will lead the school? How will the pastor be involved? Should it train students from the home church only, or open it up to others? What kind of standards will be required for admission? How will you handle students who fail academically or morally? What kind of curriculum, resources, and faculty will it utilize? What a church decides about accreditation will factor in to these considerations. Will multiple degrees be offered? Will languages be required? Will all requirements for the degree be met through the program or will students be allowed to transfer credits? Is there a substantive library available on site or nearby (especially if the church is near a large traditional seminary or religious graduate school)? What will be the requirements for those who teach, including doctrinal and ecclesiastical commitments, as well as the amount and quality of pastoral and/or teaching experience and educational credentials? Will separate facilities be needed for instruction or will it suffice to adapt present classrooms? How will the school be funded? Does the church have a budget to help subsidize it (particularly in the first few years until it gets “off the ground,” if that is the intention)? Are there businessmen or donors who want to help underwrite such an effort? How will tuition and fees paid by students or their sponsors figure in to the financing of the education? Will any financial aid or scholarships be available for students? What ministry opportunities will you provide for students? Are your beliefs substantially the same as the church? Is it somewhere you could recommend to others or a place of the type you would feel comfortable serving in some day? In a church-based seminary you will be more immersed into one particular church and its beliefs more deeply than you would be in a traditional seminary. If there is not a high degree of compatibility and theological affinity, it will be a long, hard road, or you may be bailing out (or kicked out) early. What are you hoping to do with your degree? Some church-based seminaries will offer more one-on-one time with professors, but if the school is not accredited, one may not be able to use the degree in obtaining future education. If your goal is the Ph.D. program, or if you aspire to teach in an accredited college, graduate school, or seminary, you may want to take accreditation and the rigor of the program into account, as well as the credentials and ministry experience of the teachers. If you do not believe your ultimate goals would be met by a church-based school and are still interested in having some of your education from such a setting, find out if courses transfer to the school of your choice. I have taken classes from a church-based seminary that I am not pursuing my degree through, because of a goal I have. However, the caliber of professors and courses they offer are just as good as a traditional seminary and they transferred to my school (and the cost of tuition was less). What is the cost? How does it compare to a traditional school you might also consider? Are there scholarships or financial aid you can use (either from the church seminary or from other sources)? What is the schedule? How might this work for you in the short term and long term? Does the school have a good teacher/student ratio? What ministry opportunities will be available to you through the school? Have you visited the seminary, spoken to graduates, and received recommendations for this option from leaders you trust? If you are at a church that has a seminary and are thinking about theological education and have been encouraged by your church to pursue it, are you thinking about the option right in front of you, with people you are already organically connected to? Thankfully, there are those who have blazed this trail already. Those who are considering starting a church-based seminary would do well to learn from some already in existence – some for decades. The mention of a school or church is not an unqualified endorsement, but those considering such education may want to look at schools such as those below. In the next installment of this series, we will look at ways churches can partner with other churches or ministries to provide theological education in the context of the local church. What do you think? Do you know of some other churches training pastors through a church-based seminary or academy? What are some other things churches and students should consider when contemplating this type of model? Have You Read Your Bible Before Reading Your Blogs?